The fantasy epic from the creator of Fullmetal Alchemist! "An epic fantasy with plenty of historical detail [and a] deft artistic hand." -Anime News Network "Arakawa has no problem depicting the bloody reality of war: severed limbs, decapitated heads, and torture victims. Even the poor horses aren't safe... The comparisons to Game of Thrones are inevitable." -Women Write About Comics ECBATANA IS BURNING In the prosperous kingdom of Pars lies the Royal Capital of Ecbatana, a city of splendor and wonder, ruled by the undefeated and fearsome King Andragoras. Arslan is the young and curious prince of Pars who, despite his best efforts doesn't seem to have what it takes to be a proper king like his father. 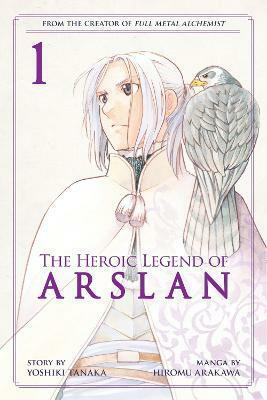 At the age of 14, Arslan goes to his first battle and loses everything as the blood-soaked mist of war gives way to scorching flames, bringing him to face the demise of his once glorious kingdom. However, it is Arslan's destiny to be a ruler, and despite the trials that face him, he must now embark on a journey to reclaim his fallen kingdom. Dr. Yoshiki Tanaka is a popular Japanese novelist who is best known for The Heroic Legend of Arslan and Legend of the Galactic Heroes. His works have been known to span across multiple media, including manga, anime, and even musicals. Hiromu Arakawa is the award-winning artist behind the immesnsely popular Fullmetal Alchemist. In addition to Fullmetal Alchemist, she is also the illustrator/author of Silver Spoons which is currently available as an animated television series in Japan and the United States. Her newest work is as the illustrator of The Heroic Legend of Arslan, a featured title in the same magazine as Attack on Titan.